Vegan Mac & Cheese Balls. Yup, you read that correctly. 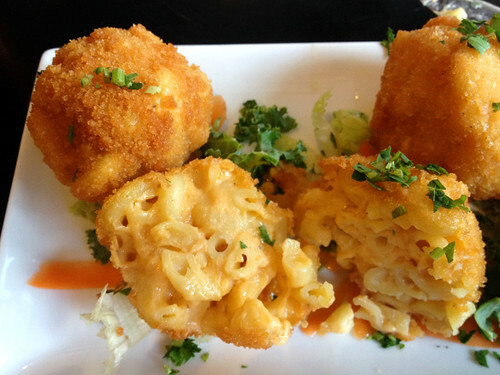 Crispy, deep-fried balls of vegan mac & cheesey goodness! My friend Michelle and I have been on the hunt for our new go-to vegan comfort food spot, ever since Foodswings (R.I.P.!) closed. We had eaten at the Wiliamsburg B.A.D. Burger location before - and I even reviewed one of their veggie burgers a couple years ago (here's the link to that review, although the beet burger is no longer on their menu now - but they have two other veggie burgers, which I should go back and try soon!). B.A.D. Burger's menu is awesome, because almost anything on it can be made vegan upon request. I had a hard time believing this when I saw the mac and cheese balls on the menu - but sure enough, the waitress assured me they could be made vegan! And wow, there is nothing healthy or good-for-you about these deep-fried appetizers, but they were so worth it! We also ordered fried avocado slices and vegan chicken fingers, which were all equally amazing, but the mac & cheese balls totally stole the show.